Do you have 5-10 minutes? That’s all it takes to squeeze in my new Pilates ab workout! In less than 10 minutes, you’ll work your entire core and feel so accomplished by taking this time for yourself. If you follow me on Instagram, you’ve probably seen that I’ve committed to a minimum of 10 minutes of exercise EVERY day in April. So far, I’m on a roll and I’m loving the way it feels. Some days I’ve barely made my 10 minute minimum, other days I’ve been able to go longer. Regardless, it just feels good to know I’m building strength. It’s been quite the postpartum journey, but I’m still plugging along, trusting the process, and knowing that strength will come with consistency and steady movement forward. This workout is one you can come back to again and again when you want a little extra ab work. This workout targets your entire core with popular Pilates ab exercises. 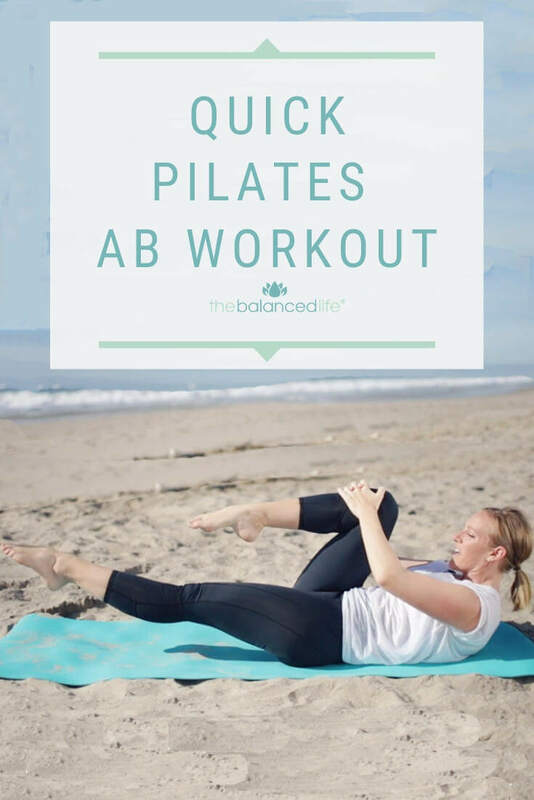 It’s a great workout on its own or a great addition to another Pilates workout, a walk, or after a run. Take this time for yourself today and let me know how it goes in the comments! PS – Looking for more quick workouts? Check out my Pilates for Tight Hamstrings workout or Relaxing Pilates Stretching Routine! This was fantastic. I was able to fit this in before I left for work today! That isn’t always feasible either. I definitely felt it working. It’s a keeper. I always love these short workouts to either add-on or to squeeze in a quick workout on those crazy days when everything seems to be scheduled at once.